Home » Blogs » Charles Gaba's blog » Deja Vu All Over Again: So now the GOP is back to "Repeal & Delay"??? I have spoken to @realDonaldTrump & Senate leadership about this and agree. Let's keep our word to repeal then work on replacing right away. OK: These guys have had eight years to come up with their "alternative/replacement" plan, clearly with nothing to show for it; does anyone honestly think that they'd actually come up with anything useful given one more year? Let's also set aside the fact that the insurance industry hates uncertainty above all else. If the ACA is fully repealed and that's that, they'll cope. If it's kept in place as is, they'll cope (not in a pretty way, mind you, but they'll cope). But I guarantee you that the one thing they don't want is for it to be "mostly" repealed...but only for a year...to then be replaced with some vague, undefined, amorphous all-new plan a year later. If you think carriers are dropping out of the individual market now, just watch what happens if they were to pull a stunt like this. However, all that aside, bear in mind that under Senate Reconciliation rules, they can't fully repeal the ACA as a whole with only 50 votes (plus Mike Pence acting as a tie-breaker); they can only repeal parts of it...primarily the ones related to federal budgetary issues. A full repeal would require 60 votes, which obviously isn't gonna happen. For example: Technically, they can't actually repeal the individual mandate...but they can change the penalty to $0 or 0.0% of household income. They can't repeal the APTC or CSR assistance...but they can set the formula to $0 or 0.0%, and so on. If you read the legislative text, is exactly what both of the GOP's current Trumpcare bills do. However, what supposedly can't be done via reconciliation is most of the regulatory stuff. It was my understanding, until recently, that the reconciliation process wouldn't allow things like Guaranteed Issue, Community Rating, Essential Health Benefits and so forth to be repealed. Obviously this assumption was partially wrong, since both the House bill (AHCA) and the current Senate bill (BCRAP) do include provisions which strike through some of these requirements outright or punt them to the states via waivers. Even so, it's useful to compare what would happen in either scenario: 1) a FULL, REPEAL of the entire ACA with immediate effect and NO replacement ("Clean" Repeal) and 2) a PARTIAL repeal, wiping out the individual mandate penalty, all financial assistance, the 80/20 MLR rule and Medicaid expansion...but keeping all current carrier regulations on actual policy requirements (Guaranteed Issue, Community Rating, EHBs and so forth). Medicaid Expansion: 15.0 million people. Basic Health Plan (BHP) in MN & NY only: 750,000 people. Now, for the individual market, I ignored the off-exchange and unsubsidized on-exchange market, dropped 1.3 million from the subsidized total to account for non-payment/attrition, and then knocked another 10% off of that to account for people who only receive nominal subsidies ($20/month or whatever). My reasoning was that anyone who's able to afford an indy market policy at full price now should still have no problem affording it if the regulations are removed as well. 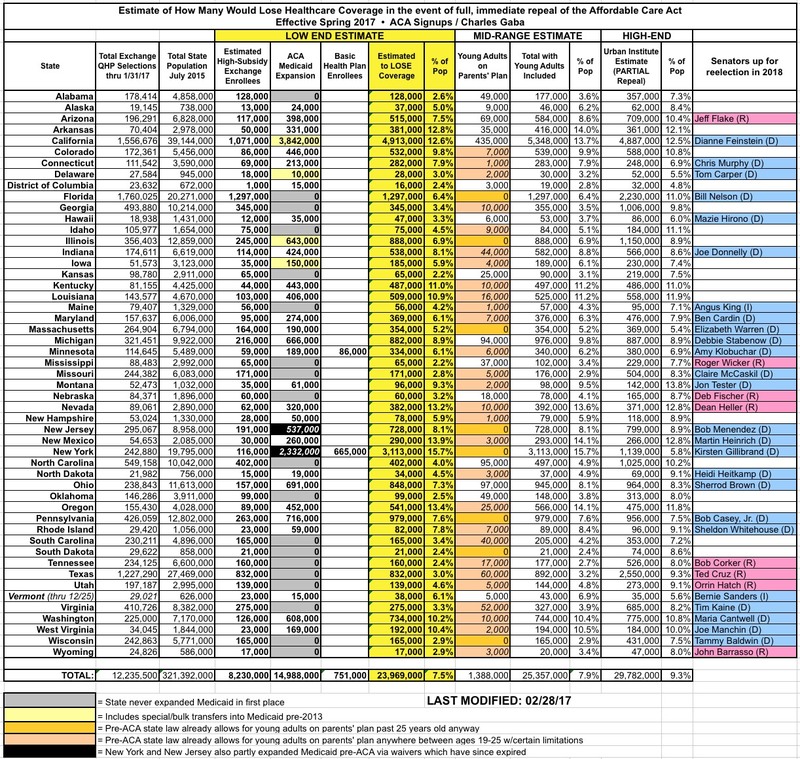 I also added a separate column listing my very rough estimates of how many young adults would no longer be eligible to enroll via their parents plans in states which don't have their own similar laws; this totals around 1.4 million people, but I listed them separately because those estimates are really fuzzy and make too may assumptions for me to be comfortable with bundling them in with the main total. Now, this was all as of earlier this year. The numbers are a bit different today: Medicaid expansion is likely up to at 15.6 million, for instance, so that's 600,000 more people would be given the boot. The BHP enrollment hasn't changed enough to even be arounding error. On the other hand, exchange enrollment should be slightly lower than last year, which should mean ending 2017 with roughly 9 million effectuated enrollees, or perhaps 6.9 million highly-subsidized enrollees having APTC/CSR cut off. That would bring the grand total down to around 23.3 million. As an aside, subtracting 7 million people from the current ~18 million people on the individual market would bring the indy market down to around 11 million people...which just happens to be almost exactly what it was in 2013, immediately before the ACA exchange policy regulations went into effect. I suspect this is not a coincidence. Meanwhile, the Urban Institute numbers don't include the Basic Health Plan enrollees in MN & NY (around 754,000 people; I've added these below), nor does it include around 1.9 million Medicaid enrollees who actually gained coverage via a pre-ACA expansion agreement between New York and the federal government which has since expired. That means that if ACA expansion is repealed, those people would also lose their Medicaid coverage as well; this should bring Urban's estimate up to around 31.7 million. In addition, there's those extra 600,000 expansion enrollees who've been added since the beginning of January, which should raise their estimates even more, to around 33 million. A little more than a year ago, the Congressional Budget Office and the staff of the Joint Committee on Taxation (JCT) estimated the budgetary effects of H.R. 3762, the Restoring Americans’ Healthcare Freedom Reconciliation Act of 2015, which would repeal portions of the Affordable Care Act (ACA)—eliminating, in two steps, the law’s mandate penalties and subsidies but leaving the ACA’s insurance market reforms in place. At that time, CBO and JCT offered a partial assessment of how H.R. 3762 would affect health insurance coverage, but they had not estimated the changes in coverage or premiums that would result from leaving the market reforms in place while repealing the mandate penalties and subsidies.1 This document—prepared at the request of the Senate Minority Leader, the Ranking Member of the Senate Committee on Finance, and the Ranking Member of the Senate Committee on Health, Education, Labor, and Pensions—provides such an estimate. The number of people who are uninsured would increase by 18 million in the first new plan year following enactment of the bill. Later, after the elimination of the ACA’s expansion of Medicaid eligibility and of subsidies for insurance purchased through the ACA marketplaces, that number would increase to 27 million, and then to 32 million in 2026. Premiums in the nongroup market (for individual policies purchased through the marketplaces or directly from insurers) would increase by 20 percent to 25 percent—relative to projections under current law—in the first new plan year following enactment. The increase would reach about 50 percent in the year following the elimination of the Medicaid expansion and the marketplace subsidies, and premiums would about double by 2026. The ways in which individuals, employers, states, insurers, doctors, hospitals, and other affected parties would respond to the changes made by H.R. 3762 are all difficult to predict, so the estimates in this report are uncertain. But CBO and JCT have endeavored to develop estimates that are in the middle of the distribution of potential outcomes. In an effort to make this information more useful, CBO and JCT have updated their estimates of H.R. 3762’s effects on health insurance coverage and premiums using CBO’s most recent baseline projections, which were released in March 2016, and adjusted the effective dates in the legislation to reflect an assumption that enactment would occur one year later. Note: This perfectly meshes with Sen. Sasse's "one year enactment delay". H.R. 3762 would make two primary sets of changes that would affect insurance coverage and premiums. First, upon enactment, the bill would eliminate penalties associated with the requirements that most people obtain health insurance (also known as the individual mandate) and that large employers offer their employees health insurance that meets specified standards (also known as the employer mandate). Second, beginning roughly two years after enactment, the bill would also eliminate the ACA’s expansion of Medicaid eligibility and the subsidies available to people who purchase health insurance through a marketplace established by the ACA. H.R. 3762 also contains other provisions that would have smaller effects on coverage and premiums. Vary premiums only on the basis of age, tobacco use, and geographic location. The CBO report goes on, of course, but you get the idea. So, why would roughly 8 million more people lose coverage under a partial repeal scenario than a full/clean repeal? As you can see, this...would be a problem. The insurance companies would still be required to sell comprehensive insurance policies to everyone, regardless of medical condition...but there would be no incentive for anyone to enroll until they needed medical care, and no financial assistance to help them out. Two of the three legs would be effectively ripped away, leaving only one leg left...at which point the stool would topple over completely. Spurred by heart-wrenching stories of sick people denied health coverage, the state of New York did what many of President Obama's critics say he should do now -- it passed a relatively simple law requiring insurers to accept all applicants. Other states have taken similar steps, making narrowly targeted changes instead of trying to overhaul their whole healthcare systems. But two decades later, New York's experience offers a cautionary tale: Making isolated changes to the complex medical insurance system can have unwelcome consequences. Premiums in New York are now the highest in the nation by some measures, with individual health coverage costing about $9,000 a year on average. And nearly one in seven New Yorkers still lacks health coverage, a greater proportion than before the law was passed. The state has become a victim of a dangerous dynamic in insurance markets. Laws allowing consumers to buy insurance at any time often saddle companies with a lot of high-cost customers. That in turn drives up premiums, pushing away younger, healthier people who are vital to a functioning insurance system. The article goes on to explain that while other states also passed Guaranteed Issue laws, NY was the only one to also require Community Rating as well. The law allowed consumers to buy insurance after they became sick with only a relatively short waiting period. They could also drop it when they no longer needed it. In other words, under this scenario, not only would the subsidized portion of the individual market be wiped out, so would nearly all of the unsubsidized market...including almost all of the off-exchange market. That's exactly what happened in New York: I believe their individual market size had dwindled to something like 20,000 people statewide by 2013 (just before the ACA exchanges rules launched). There you go! Perfectly balanced...with everyone stuck sitting on the floor.